Local residents in Bewdley are excited to see a real transformation of their neighbourhood with a development of 16 modern family homes by The Community Housing Group providing new housing opportunities. The development, a mix of 2 and 3 bedroom energy efficient houses, built by Oakleaf Commercial Services, provides the chance to climb onto the property ladder through shared ownership (which is a part rent/part buy option) as well as homes to rent. Sam is now especially pleased to find a new home in the area that she grew up in, enabling her children to do the same. She said: “I’ve lived on Wribbenhall my whole life so I’m thrilled that I can stay in the area near my family.” She then continued to say: “My son is so excited about finally having his own bedroom and this new home has enabled me to give my children somewhere nice to grow up with all the space they need and for us to move forward with our lives. 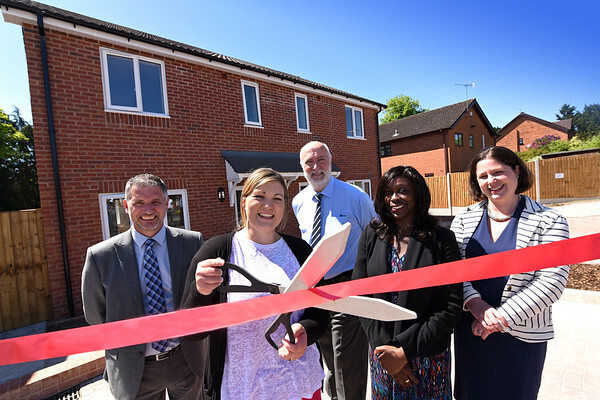 The Community Housing Group celebrated the ‘official opening’ of their new homes in Bewdley this week, with a ribbon cutting ceremony and tour around the properties. The Group welcomed Christine Seaton and Karen Matthews from Home England to the opening, who helped the company to secure Government funding. Local residents who have been pleased to see a real transformation of their neighbourhood also came, along with members of staff involved with the build.